What's being done to help people affected by Cyclone Idai? UK charities have launched a joint appeal to help people affected by Cyclone Idai. 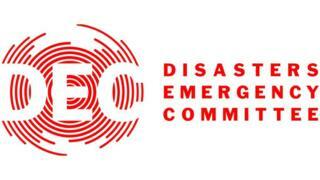 The 'Disasters Emergency Committee' (DEC) aims to bring together 14 major charities in the UK to provide and deliver aid in places where there has been a natural disaster. This comes after Cyclone Idai caused massive damage in southern Africa that could affect hundreds of thousands, if not millions of people, according to experts. According to the authorities, about 700 people across Mozambique, Zimbabwe and Malawi have been killed in what the United Nations (UN) has called a "massive disaster". 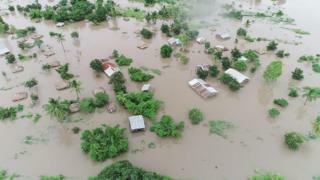 The tropical cyclone has caused large-scale destruction and flooding to countries in the region. Thousands remain trapped by the floodwaters, and many of government's relief centres in Mozambique have only just started receiving food supplies. What's the situation like on the ground? All the reports suggest that the situation for emergency services there is extremely difficult. Although supplies have started to arrive, some communities are struggling to get help. Charities are worried about disease spreading and there is concern about getting clean drinking water for the people affected. Rescue teams have been dropping high-energy biscuits, water cleaning tablets and other supplies to people directly surrounded by water and mud. According to experts, at least 1.7 million people were in the direct path of the cyclone in Mozambique. Authorities say hundreds of people have died in the country because of the flooding and high winds but are warning that number could rise. This is shaping up to be one of the worst weather-related disasters ever to hit the southern hemisphere. 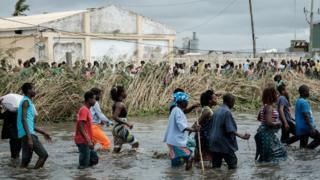 Mozambique President Filipe Nyusi has called it "a humanitarian disaster of great proportion". 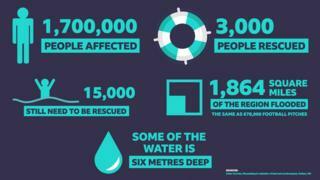 3,000 people have been rescued there so far but there are still 15,000 people that still need rescuing. Another country affected by Cyclone Idai is Zimbabwe. The government there says many have died and hundreds are missing. Other African countries, including Malawi, have been seriously affected by the cyclone too. The UN says nearly a million people have been affected there. The UK government has promised to send £6 million of humanitarian relief aid to help people in Mozambique and Malawi, along with tents and shelter kits. Now, the DEC has also pledged its support. It will work closely with national organisations to deliver emergency shelter kits, food, tablets to clean water and medical help. Fundraising appeals from the DEC will be on British TV channels including the BBC on Thursday 21 March.